Providing Carpet Cleaning in Gold Beach, Brookings, Port Orford, Bandon, Oregon. We are members of the Chamber Commerce Brookings, Gold Beach, Oregon. Do your Carpets need attention? Does your carpet look overused and matted? Don’t waste the weekend scrubbing those stains out with a store bought carpet cleaner. The main cities we work in are Gold Beach, Brookings, Port Orford, Bandon, Crescent City, and of course all of Curry County. Let us show you what our we can do for your Carpets!…It’s Simply incredible!! Plus we have a Special Ozone Carpet Sanitization System for Carpets that need extra Odor and Allergy Relieve. See the “Ozone Pure Air Treatment Sheet. Also you can see these special procedures in action in this video. Do your Tile or Stone floors need attention? Does your grout no longer resemble the color you worked so hard to choose? Don’t waste the weekend on your hands and knees with a toothbrush.Let us show you what our rotary cleaning systen can do…Simply incredible!! Most people only notice the condition of their tile, stone and other hard surfaces when they become visibly soiled. But by the time it’s finally noticeable, layer upon layer of stains, bacteria, and mineral deposits will have built-up into a mess you can’t clean on your own. It used to be that floors, showers, and countertops had to be replaced once they reached this state — but now you have a better option. 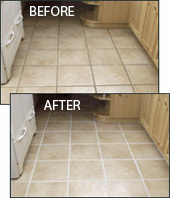 With our rotary cleaning system we can restore soiled tile, concrete, natural stone, and grout to look new! Even if your hard surfaces still look clean, they almost certainly contain unseen filth that can affect brightness and sanitation. So for complete restoration or routine maintenance, let us demonstrate the amazing results of our revolutionary system. Emulsifier – First we apply a 100% Non Toxic Biodegradable emulsifier that loosens up the dirt, grime, oils, and bacteria. Pressure – We utilize contained high pressure water to penetrate the toughest area; to clean your tile grout and Carpet. Heat – High heat is used to blast away the toughest soil. This is important in Tile Grout & Carpet Cleaning. Vacuum – Our patented vacuum relief system extracts 98% of the water and soil left on the floor. Ask about getting your Carpets and windows done on the same day!